65 pagesA4 softcover portrait format. The magazine is an A4 portrait format and it features sixty-five pages with no advertisements in there anywhere accept a “how to order” or subscribe page on the front and back. I really like this a lot but the price is and I literally mean the price is € 11.00 which is probably 1/3 more or double some other mags that you might find in the newsagents. The choice then is yours. Half a magazine and half advertisements or a more expensive mag with no ads. I like this approach which almost feels just like another part of the book we looked at last week. I buy a magazine to read it – not to skip through the ads. The writing is varied from author to author and the pictures are all very well shot and lit. The articles are mainly set out as a preface to set the scene and then SBS (step by Step) after that. I will say that sometimes because of the non-linear layout you get lost in the text as to where you should be looking at. Also this magazine does sometimes need a proof-reader as some authors are better writers than others. If it is proofread in English than that proof-reader needs a little help? Saying that this magazine is available in English, French and Spanish which is a mean feat for a periodical and the look of the layout – while not linear and easy to follow, is attractive to look at. Let’s get into these five stories in this magazine in order. Now from looking at this first build dio in the magazine I can see that the modeller Lechu Villanueva is not big on the construction process – in what looks to be a good start with Panzer Aces he presents a vignette set in Kursk for "Operation Zitadelle" His panzer II terrorizing the Russians in a trench it is about to roll over. The lack of in progress building shots are however counterbalanced by many painting and weathering step by steps (SBS) as we look at the article. True to it’s word there is a lot of diorama going on in this article. The scattering of light shrubbery and the grass are a counterpoint to the roughly cut earth and trench as well as the battered and beaten German tank. While I think there is some improvement in this builder’s writing – his modelling already is very nice. Next we go forward in time to the end of WWII with Antoine Puzo’s diorama called “The end of war, Berlin 1945,” in which we see the scene of Hitler’s last stand in his grandest city reduced to death and the need for food. The build of this small self-propelled gun mix-up is a very well put together story. You get to see a lot more of the AFV being built and the addition of the two figures (some of the better two in the last few years) from Stalingrad make the dio stand out. This vignette demonstrates how we can wrap a vehicle around a small base and a couple of figures and tell a small story explains the whole building and painting process as well as the items used for making this magnificent vignette. The strewn details right through the street with debris everywhere adds more interest and points to ponder which the reader can learn a lot from. A well-known trio of authors to Panzer Aces – Mr Jose Luis Lopez, Rodrigo Hernandez Cabos and Rodrigo Hernandez Chacon are next up with a collaboration that features a not often seen 1/48th scale diorama featuring a scene in France around the time of D-Day. The groundwork on this diorama is something spectacular and the many layers from the ground up to the tops of the branches of the trees is depicted and explained in some good detail. The ground work really does look impressive to me. The second part of the article features not only the vehicles being painted and weathered but a few pages on the painting of the figures as well. These are all a bit “dark” for my taste they look good in this setting and there are some good skills shown off here and the step by step process of these elements are another handy tool to have at your disposal. A well put together article. “Wilkommen im Zoo” is a nice story and diorama made by Antonio Casas who has shown the struggle for the area around the Berlin Zoo in 1945. We see three Germans surrendering to the Russians amongst the debris and a dead bear in the Zoo. The Zoo background that brings nature and man-made elements together gives the model makers great license to have greenery with stone, iron and the steel of the knocked out AFV. The dead animal in the Zoo and the surrounds are described in the pre-amble and then we get into the groundwork straight away. The adding of the several small animals right throughout this article add many points of interest that you would constantly pick up as you notice them. Not just the dead bear but all of the other creatures and the human artifacts strewn through the street here. Lastly we go back to school with some “Modelling Lessons” in which we get a free lesson that was not featured in the “Landscapes of War” book (they ran out of room.) The author shows just how to use sculpting materials to how to sculpt and paint a tree trunk with its roots. It is a nice add on to this and maybe a taste to those who do not have the book what is in there. It reminds me that this whole magazine feels like a worthy addition. A few niggles which I have pointed out aside this is a great magazine and well worth the admission price. The subject is not so well covered - panzers and figures always stealing the limelight – this magazine does something to fill the gap. 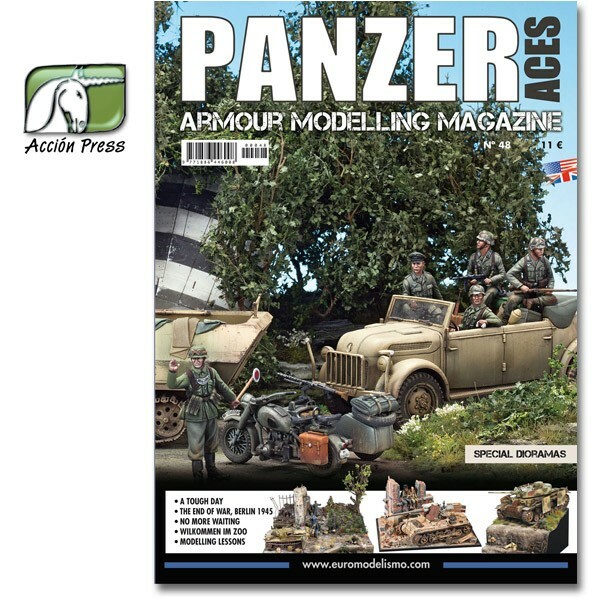 This issue is available now - you can order Panzer Aces magazines and “Landscapes of War” which accompany it directly from the publishers at this link from their website.